These products are manufactured in compliance with stringent global standards of plant operations, quality and safety. The companys facilities have been approved and certified by international agencies including Det Norske Veritas (DNV). The operations at all plants are closely monitored through distributed control systems (DCS), which facilitate a high degree of control over the quality of products. IGLs flagship chemicals division started out with a path-breaking green approach to manufacturing ethylene oxide and derivatives. 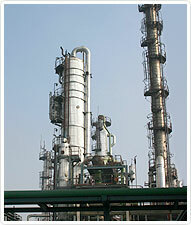 Using the molasses-ethyl alcohol-ethylene 'green route', the company is the only one of its kind in the world. With the emphasis now increasingly shifting to green manufacturing, the chemical division is well poised to meet the industrys need for environmentally responsible products and production techniques. Keeping in mind the critical dependence on agricultural feedstock, the company has taken up several initiatives including backward integration into sugar manufacturing to ensure seamless raw material availability. Other complementary initiatives include co-opting the cane growing community to ensure cane availability while providing adequate returns to the farmer. Apart from chemicals, India Glycols has a significant presence in the natural active pharmaceuticals and nutraceuticals space with Ennature Biopharma; a well-established natural gum division manufacturing guar gum and a variety of derivatives; a spirits division that manufactures country and Indian-made foreign liquor adhering to the highest quality standards; and Shakumbari Sugar  a well-established player in the Indian sugar industry. IGL has traditionally looked to leverage the export potential of its products. The company has therefore initiated the process of aligning to emerging global trends and has established facilities and operations that are in compliance with global good manufacturing practices. The company strives to achieve excellence through proactively addressing customer needs and requirements. Integral to this approach is the identification and development of customised products backed by research and development support. IGL's R&D function is not only driven by organisational needs, but more importantly by customer needs. Its R&D centre employs state-of-the-art equipment that empowers IGL scientists and engineers to consistently deliver customised solutions that meet, and at times, even exceed customer expectations.